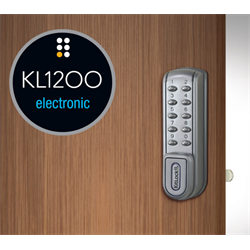 KitLock is a digital keyless lock solution designed for lockers and cabinets in both private and public situations. Kitlock 1200 series are designed for applications requiring a tougher more robust lock with more operations on a set of batteries. A 'slam latch' option is available (sold separately) to allow the locker to simply be closed to automatically lock. KitLock ends the nightmare of losing or managing keys while enhancing security. A four digit code is used to access the locker or cabinet, while a 6 digit maintenance code can be made available. A master code is used for management. KitLock can operate in two modes. In PRIVATE mode, the same code is always used to unlock for environments like schools or employee storage where the same person accesses the locker. In PUBLIC mode, the user enters a four digit code twice (second time to confirm the code), which locks the lock. The same code is used to unlock the lock, and then the code is automatically cleared for the next use, for applications like public lockers in clubs, spars, gyms or pools. KitLock 1200 also includes an auto unlock facility. When in PUBLIC mode, the lock can be programmed to automatically unlock after a user selectable time of 2, 4, 6, 8 or 12 hours. KitLock operates on 2 AAA batteries (supplied) for up to 50,000 activations, with an external 9V battery connection as a back-up, and features a low battery alert, and non volatile memory to retain the code in case of power failure.